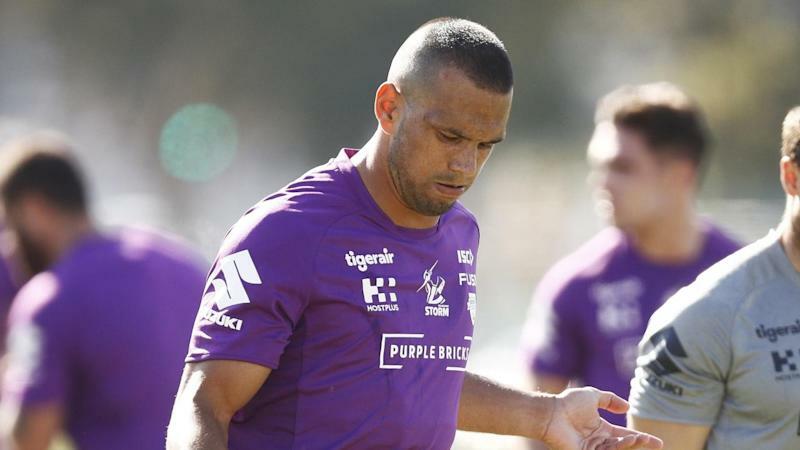 Melbourne Storm centre Will Chambers admits he won't be at peak form for the first few NRL rounds due to a pre-season injury leaving him underdone. Chambers was solid in Melbourne's opening round win over Brisbane last week and the Storm are set to be challenged on Friday night by Canberra, who kept Gold Coast scoreless. Chambers hurt his foot during the All-Stars match in early February, which kept him out of the Storm's two trials. The 30-year-old said it was frustrating to pick up the injury with the NRL season looming. "I would have liked to have got a game under my belt," Chambers said. "It was a frustrating injury because it wasn't bad but I couldn't really run properly - it felt like I had glass in my shoe - but once I got going it was OK.
"It will be a couple of weeks; I didn't do too much in the game and I was blowing a heap but hopefully the fitter I get the more involved I can get." He has switched sides this season to line up at left centre, alongside speedster Josh Addo-Carr, and said he hoped that their new combination could yield some tries. "I'm pretty lucky to have a guy outside in Josh Addo-Carr who has genuine gas," he said. "I'm losing a step or two and he's gaining it so it's good." With Billy Slater now retired, Chambers has more than 100 NRL caps more than any other player in the Storm backline. Melbourne coach Craig Bellamy said before round one that he was looking for improved discipline from his veteran, who spent six games sidelined last season because of three separate suspensions. Chambers wouldn't be drawn on the details of their conversation and denied it was a frustrating year for him at the club.